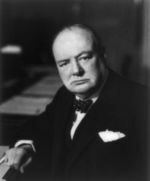 Churchill might well have said that to be born English is to have won the first prize in the lottery of life. But if he did, he was only quoting Cecil Rhodes. Pedantry is quintessentially English, isn't it? Ah-ha! But when you say "pedantry is quintessentially English" you're only quoting my Uncle Bert. Who would want to quote Rhodes? ?